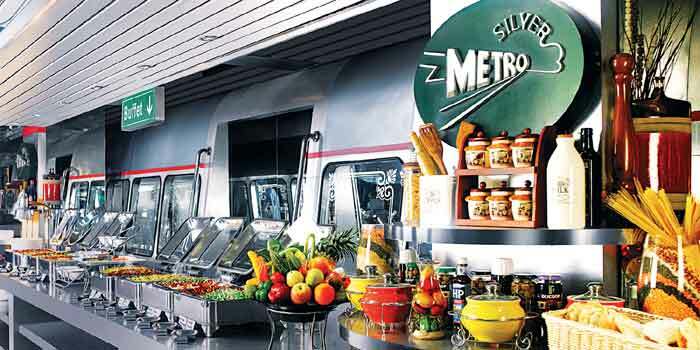 Silver Metro, located inside a mall, clearly attracts a cross section of hungry diners, seeing as the place was bustling with late shoppers and boisterous families even on a weekday. We were quite taken with the interiors, which actually simulate an underground train in extensive detail a�� from the a�?seatsa��, handrails and platforms, to the gleaming chrome, glass and extra-bold signage. The restaurant serves only buffets for both lunch and dinner, covering all the usual suspects a�� Indian, continental and Chinese. 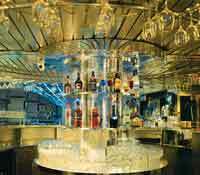 They have a full-fledged bar as well so you can wash down your meal with a cocktail or two while you work your way through the extensive line-up. We whetted our appetite with a mix of starters and salads a�� sprouts, veggies, pastas and our personal favourite a�� the dim-sums, that were rather nicely made although limited to just chicken and veggies. Save some space for the mains, which are hearty and filling. Meat lovers will enjoy the lemon murgh, gongura mutton, egg masala and chicken kebabs which supplement the dum biriyanis and rotis nicely. Vegetarians are not neglected with plenty of wholesomechoices likeA� adaraki rajama, kadahi paneer and tawa bhindi. We ended with classics a�� gulab jamoon, and coconut halwa.